I took this photograph of Tillman Chandler in 1975 and have never exhibited or published it. There are reasons I’ve kept it hidden away all these years, just as there are reasons now for bringing it to the light. Tillman Chandler and Junior, Sodom, Madison County, NC, 1975. I was new to Sodom back then – probably my second or third stay with Dellie and her adopted son Junior - and I was still finding my way in the wider community, something I couldn’t have done without Dellie and her extended family providing access. One day Dellie suggested that Junior take me to meet Tillman who was Dellie’s cousin and a tobacco farmer who lived alone in a cabin on top of the mountain. Tillman’s brother was Dillard Chandler, the noted ballad singer and protagonist of John Cohen’s film The End of An Old Song, but where Dillard was known to be out and about, Tillman rarely left home. Tillman was there when we arrived, and friendly as I recall, but he wouldn’t let me photograph him. I could photograph around his place, but not him. 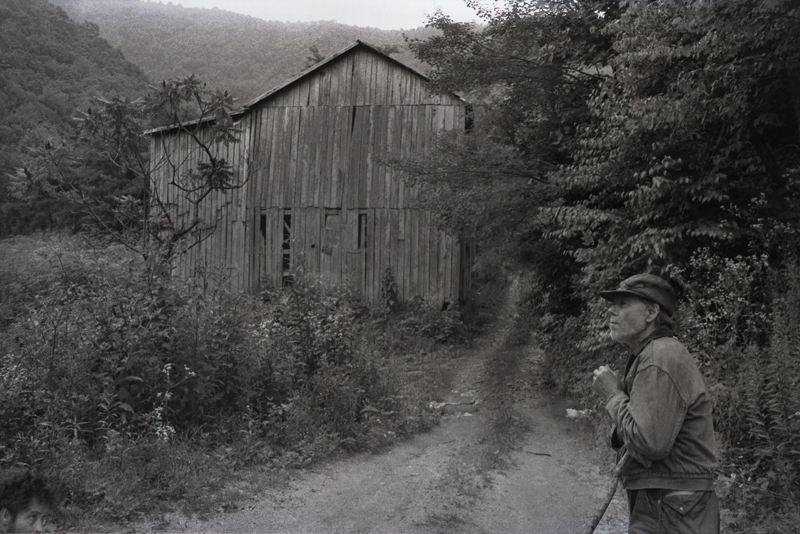 We stayed an hour or more and I made some pictures of his tobacco and barns. Walking to my car, I turned to thank him and saw this picture. This was in the days of manual-everything cameras, but I estimated the shutter and aperture settings and pre-focused the lens. I steadied myself, and the camera, and pressed the shutter. I liked the image when I saw it, but felt it lacked energy and it was easy enough to set it aside. But more importantly, there was the matter of my stealing the picture after he had asked me not to and I knew I’d never do anything with it no matter how much I liked it. I saw Tillman infrequently after that. No one saw him much. He would walk the couple of miles to Rube Gosnell’s store every two or three weeks, pick up some corn meal and feed, a few groceries, some snuff, and walk back to the cabin. A couple of years later folks hanging out at the store realized they hadn’t seen him in a few weeks and decided to go up there. They found him on the floor of the cabin, obviously dead for some time as rats had eaten his body. His bones were still garbed in overalls, shirt, and hat. Reportedly, there were thousands of dollars in cash stuffed into the hat’s brim. Our young friends Kelsey and Tommy have been looking at a piece of land over in Sodom recently and mentioned there was a small graveyard on the property with someone named Tillman Chandler in it. That prompted me to find the old negative and scan it. From the barn in the background, they confirmed it was the place they were interested in. For me, Documentary Expression should be a reflection of both the subject and the artist. While I had the image open In Photoshop, I saw a piece of the picture I had never noticed before - Junior’s head in the lower left corner. Those eyes – fixed and riveting – mimicking my own fear and nervousness as I shot the single frame. That simple element – Junior’s eyes – prompted my own memory and brought back the tension and guilt at the moment I made the photograph, and the energy I thought the photograph lacked in the first place. But what of the ethics of publishing the picture now, years after Tillman’s death? Not only did I take his picture without permission years ago, but now I’m posting it. 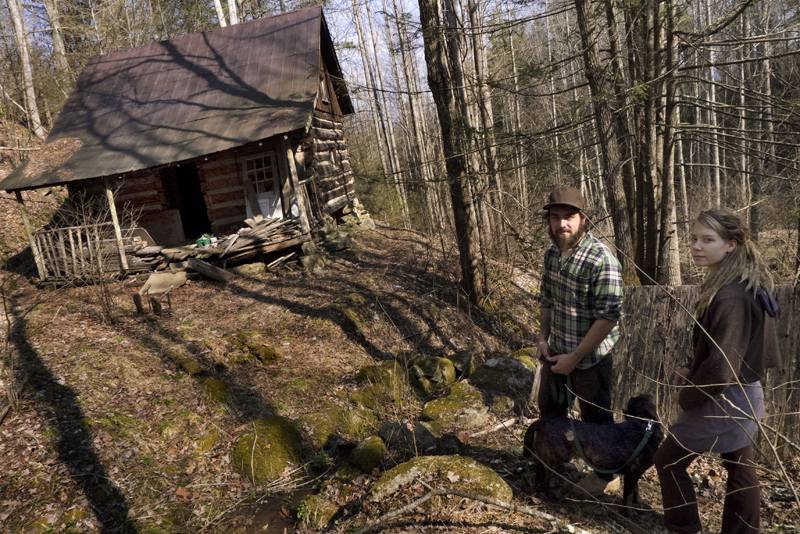 Kelsey, Tommy, and Maci at Tillman's old cabin, Sodom, Madison County, NC, 2013. I think there is merit in the story, something to be learned that is hard not to share and shouldn’t be ignored. Photography is about memory. It reminds us of people and places from our past, and our present, and helps us understand the particulars of our lives – how we got from there to here. When I look at this photograph of Tillman today, I see an old man holding a cane staring out to an unseen distance. He would be dead less than two years later. There’s a barn, and a dirt road, with a mountain range in the background. It’s serene, and quiet, and I want to believe Tillman, and his family, would think it was a good likeness of him. A likeness worth remembering. 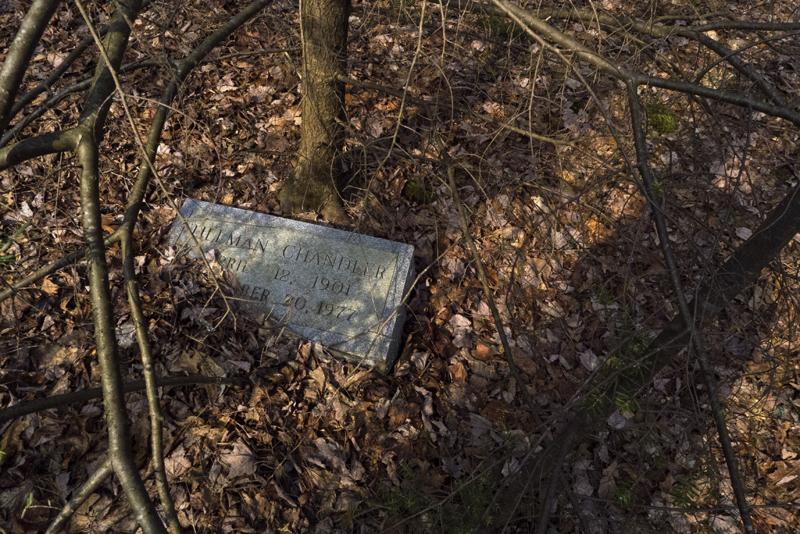 Tillman's Grave, Sodom, Madison County, NC, 2013. Especially with the added words, the photograph paints a picture of place and people. In 1975, there were few remaining people like Tillman Chandler - fiercely independent, raising tobacco for a little cash money, who lived and died by himself on the side of a mountain. I think the photograph and story speak to our shared history of place, as well as, the personal past of the Chandler family, which I hope makes it worth sharing.